On March 14 2012 there was seen an unusual triangle shape seen on the surface of the sun. May be related to the rise of the Antichrist, a prophesied evil dictator in the Bible's Book of Revelation chapter 13. March 4 2012. Putin possible Antichrist was elected Russian President again, to a 6 year term ending in 2018, when he is 66. March 6 2012. There were 2 solar flares (see this page) that hit earth on March 8 2012. Could this be connected with the election of Putin the Antichrist? Revelation 13:13, King James version: "And he doeth great wonders, so that he maketh fire come down from heaven on the earth in the sight of men". March 14 2012. 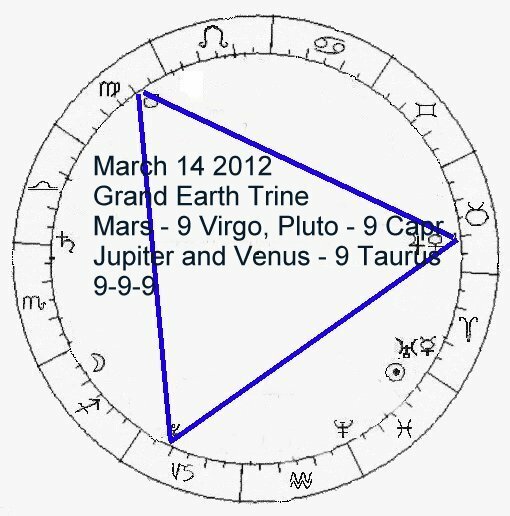 Note that connected with the election of Putin is an unusual and very ominous astrology pattern on March 14 2012 (March 15 is the Ides of March, when Julius Caesar was assassinated, "Beware the Ides of March") of 4 planets in a Grand Earth Trine, of a triangle pattern with the planets spaced at exactly 120 degrees. 4 planets at 9 degrees, in Earth signs, in a Grand Earth Trine, with Venus and Jupiter at 9 Taurus, Mars at 9 Virgo, Pluto at 9 Capricorn. So 9-9-9 which is 666 upside-down. Definitely an Antichrist-connected Astrology pattern, here possibly related to Putin reelected as Russian President, possibly by a huge amount of election fraud and ballot-stuffing. Also note that the on the Ides of March was a Roman Holiday of celebration for Mars the War deity. And Jupiter/Mars/Pluto in this trine could mean the Antichrist/War/Death in a trine where their power is amplified, these three horsemen could be riding in 2018 - 2020. Note there were 6.1 and 6.9 quakes off Japan, 6.4 quake in New Guinea. And a triangle shape was seen on the sun exactly on this day March 14 2012. See it below, that seems to be connected to the 9-9-9 triangle astrology pattern on the date and the return of Ra the sun deity with Putin back in power "put-in". See this page on Putin's connection to Ra and the pyramids. Note that it also looks like a pyramid on the sun, an Egypt connection to Ra. 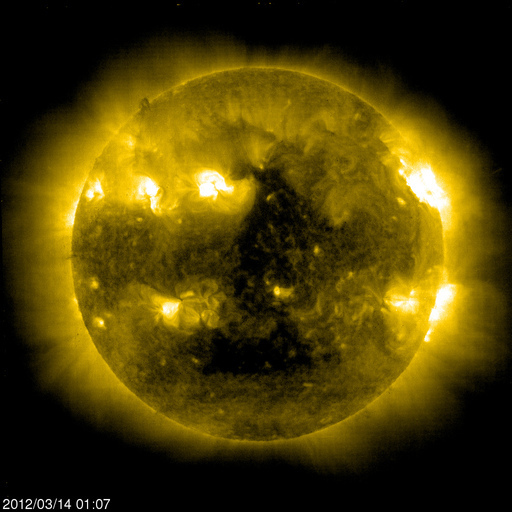 The March 14 2012 triangle on the sun. Source: SOHO (ESA & NASA). So what is going on here? Possibly this could relate to the rise of the Anrichrist Putin. Could the triangle on the sun represent a pyramid, and the return of Ra with Putin? See more on these subjects on other pages of Revelation13.net. See other pages of this web site for more on Astrology, prophecies (Bible, Nostradamus, etc.) and the King James version English Bible Code.